Our February esbat was led by Aislin, and we centered around the theme of self-love. With V-day coming up, it seems as though everyone is focused on love, but many times we like to focus on self-love, one of the keys to personal growth. Blessed be! Our Imbolc celebration was last night. 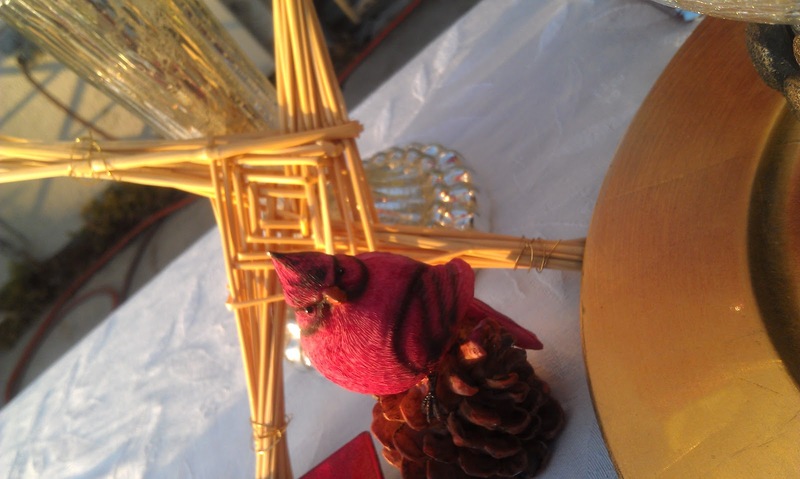 Between Imbolc being one of my favorite sabbats, and my resolution to make sabbats feel more like holidays, I had a lot of fun preparing for yesterday evening's festivities! I made each sister a small bottle of holy water to take with them- as Imbolc is a time of spring cleaning and cleansing, a bit of holy water can't hurt. We had a healing shrine set up, as Brighid is a goddess of healing, as well as creativity and inspiration. Our ritual altar featured our creative offerings, a small brick hearth, a brighid's cross, and white lilies in a red vase. 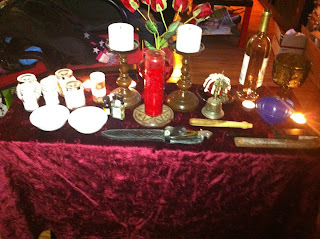 It was a beautiful ritual, and we were lucky to have three of our Shadow Sisters join us, for a lovely circle of seven. Like our page on facebook, for seasonal crafts, as well as updates that come more often than this blog- our blog feeds through to our facebook page.